International air passenger traffic rose a solid 5.1 percent in February, helped by South Korea's hosting of the PyeongChang Winter Olympic Games, official data showed Sunday. 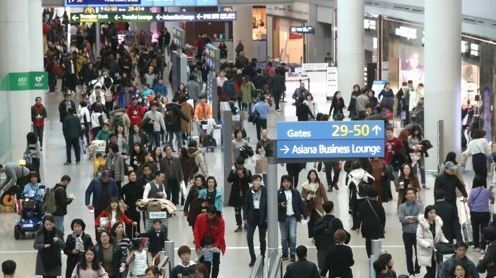 A total of 6.86 million passengers used international flights into or out of South Korea in the one month period, the Ministry of Land, Infrastructure and Transportation said. It said besides the Winter Games, there were more people traveling abroad as many kids were off from school and families took overseas trips. South Korea's PyeongChang region, 180 kilometers east of Seoul, hosted the games that were attended by a record number of athletes and sports officials. In said traffic with Japan and Southeast Asia led growth by increasing 15.6 percent and 11.6 percent, respectively, last month, compared to a year earlier. Corresponding numbers for China, on the other hand, dropped 21 percent due to strained diplomatic ties between South Korea and China over the deployment of an advanced U.S. missile defense system in South Korea. The latest findings showed that while international air traffic rose, domestic passenger numbers decreased 3.7 percent on-year to 2.22 million users. Combined international and domestic traffic, meanwhile, moved up 2.8 percent last month from a year earlier to 9.08 million people leaving and arriving the Northeast Asian country in the 28-days of the month. By airport, passenger traffic rose at Incheon International Airport, the country's main air hub, along with Gimhae and Daegu airports. In contrast, passenger traffic at Jeju international Airport contracted.